Looking for an affordable gas grill but don't want to skimp on the premium features? Our excellent line of Blaze Gas Grills offers a combination of solid engineering, quality stainless steel construction and commercial-grade cast stainless steel burners to help ensure your Blaze grill will last for years and provide maximum performance. And with other great features like a flame stabilizing grid to prevent flare-ups, heat zone separators for better temperature control and a flame thrower ignition it is easy to see why our Blaze gas grills are one of the best value bbqs on the market. Blaze Gas Grills: There’s a Lot to Love! Founded in Baton Rouge, Louisiana, in 2012, Blaze Gas Grills combine premium features and top notch, contemporary design to deliver affordable, high-performance gas grills. Blaze Gas Grills are made with 304 stainless steel and are designed in the USA. Backed by a best-in-class lifetime warranty, Blaze Gas Grills are solid and dependable, and come in freestanding or built-in models available for natural gas or propane, and portable propane grills. All Blaze Gas Grills provide you with premium quality at an amazing price, with features that you usually only find on much more expensive grills. If you’re looking for a well-built, dependable grill that will last for many years, nothing beats a Blaze. Whether you want a basic gas grill or one with all the bells and whistles, Blaze offers something for every backyard BBQ chef! A Blaze Gas Grills are engineered with the griller in mind. All models are built with a durable 304 stainless steel body, double lined hoods to protect you from high temperatures, and commercial-grade stainless steel burners. Blaze Grills are designed to make grilling easier and more enjoyable. In addition to great gas grills, Blaze offers a full line of outdoor kitchen equipment made of 304 stainless steel including refrigeration, doors & drawers, trash bins, bar centers, and vent hoods. Blaze offers everything you need to build the ultimate outdoor kitchen. In addition, we offer Blaze outdoor kitchen packages that include storage and refrigeration. All 3 come in Built-In or Freestanding configurations, and the Professional also offers a portable model model that is perfect for camping or tailgating. Sizes range from 25” to 44”, and the Professional and LTE series include internal and knob lights. 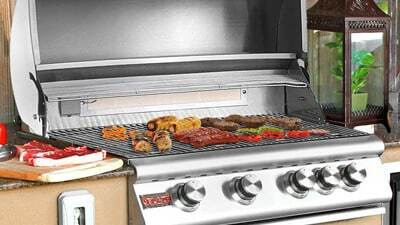 All Blaze gas grills have a lifetime warranty that covers your new grill against any defects in the manufacturing and workmanship on the cooking grids, stainless steel housing, stainless steel burners, flame tamers, heat zone separators, control valves and all other stainless steel components. Electrical and ignition components are covered for one (1) year after the date of purchase. Grills must be registered within thirty days for the warranty to apply.